For other people named Andrew Fisher, see Andrew Fisher (disambiguation). Andrew Fisher (29 August 1862 – 22 October 1928) was an Australian politician who served three separate terms as Prime Minister of Australia – from 1908 to 1909, from 1910 to 1913, and from 1914 to 1915. He was the leader of the Australian Labor Party from 1907 to 1915. Fisher was born in Crosshouse, Ayrshire, Scotland. He left school at a young age to work in the nearby coal mines, becoming secretary of the local branch of the Ayrshire Miners' Union at the age of 17. Fisher emigrated to Australia in 1885, where he continued his involvement with trade unionism. He settled in Gympie, Queensland, and in 1893 was elected to the Queensland Legislative Assembly as a representative of the Labor Party. Fisher lost his seat in 1896, but returned in 1899 and later that year briefly served as a minister in the government of Anderson Dawson. In 1901, Fisher was elected to the new federal parliament representing the Division of Wide Bay. He served as Minister for Trade and Customs for a few months in 1904, in the short-lived government of Chris Watson. Fisher was elected deputy leader of the Labor Party in 1905, and replaced Watson as leader in 1907. At the time, Labor supported the Protectionist Party minority government of Alfred Deakin. Deakin resigned as prime minister in November 1908 after Labor withdrew their support, and Fisher subsequently formed a minority government of his own. It lasted only a few months, as in June 1909 Deakin returned as prime minister at the head of the new Commonwealth Liberal Party (a merger of the Protectionists and the Anti-Socialist Party). Fisher returned as prime minister after the 1910 election, which saw Labor attain majority government for the first time in its history. Fisher's second government passed wide-ranging reforms – it established old-age and disability pensions, enshrined new workers' rights in legislation, established the Commonwealth Bank, oversaw the continued expansion of the Royal Australian Navy, began construction on the Trans-Australian Railway, and formally established what is now the Australian Capital Territory. At the 1913 election, however, Labor narrowly lost its House of Representatives majority to the Liberal Party, with Fisher being replaced as prime minister by Joseph Cook. After just over a year in office, Cook was forced to call a new election, the first double dissolution. Labor won back its majority in the House, and Fisher returned for a third term as prime minister. He struggled with the demands of Australia's participation in World War I, and in October 1915 resigned in favour of Billy Hughes. Fisher subsequently accepted an appointment as High Commissioner to the United Kingdom, holding that position from 1916 to 1920. After a brief return to Australia, he retired to London, dying there at the age of 66. In total, Fisher served as prime minister for just under five years; Bob Hawke is the only member of the Labor Party to have served for longer (8 years). Fisher was born on 29 August 1862 in Crosshouse, a mining village 2 miles (3.2 km) west of Kilmarnock, Ayrshire, Scotland. He was the second of eight children born to Jane (née Garven or Garvin) and Robert Fisher; he had one older brother, four younger brothers, and two younger sisters. His younger sister died at the age of 10 in 1879, the only one of the siblings not to live to adulthood. Fisher's mother was the daughter of a blacksmith and worked as a domestic servant. On his father's side, he was descended from a long line of Ayrshire coalminers. According to family tradition, his paternal grandfather was persecuted for his involvement in the fledgling union movement, and on one occasion was left homeless with five young children. Although he was probably only partially literate,[a] Fisher's father was prominent in the local community and involved with various community organisations. He was the leader of a temperance society, and in 1863 was one of ten miners who co-founded a cooperative society. He and his family were active members of the Free Church of Scotland. Fisher spent most of his childhood living in a miners' row, which had an earthen floor and no running water. He was kicked in the head by a cow as a small child, leaving him mostly deaf in one ear. The injury may have contributed to a childhood speech impediment and his reserved nature as an adult. As a boy, Fisher and his brothers fished in Carmel Water, a tributary of the River Irvine, and enjoyed long walks across the countryside. He was athletic, helping form a local football team, and stood 178 centimetres (5 ft 10 in) as an adult, above the average at the time. In later life, Fisher recalled attending four schools as a boy. The exact details are uncertain, but he is known to have finished his schooling in Crosshouse and to have attended a school in nearby Dreghorn for a period. [b] The standard of public education in Scotland was relatively high at the time, and his schoolmaster in Crosshouse had received formal training in Edinburgh; the main focus of the curriculum was on the three Rs. He later supplemented his limited formal education by attending night school in Kilmarnock and reading at the town library. The exact age at which Fisher left school is uncertain, but he could have been as young as nine or as old as thirteen. [c] He is believed, to have begun his working life as a trapper, opening and closing the trapdoors that allowed for ventilation and the movement of coal. He was later placed in charge of the pit ponies, and finally took his place performing "pick-and-shovel work" at the coalface. When he was 16, he was promoted to air-pump operator, which required additional training and was seen as a relatively prestigious position. Fisher's father suffered from black lung disease, and gave up mining around the same time as his oldest sons began working. He subsequently became the manager of the foodstore at the local cooperative, and the family moved out of miners' row. They later lived in Kilmaurs for a period, but eventually returned to Crosshouse and leased a small farm. Fisher's father then worked as a gardener and apiarist, supplementing his income with contract work repairing the machinery at local mines. He died of lung disease in 1887, aged 53. In 1879, aged 17, Fisher was elected secretary of the Crosshouse branch of the Ayrshire Miners' Union. He soon came into contact with Keir Hardie, a leading figure in the union and a future leader of the British Labour Party. The pair met frequently to discuss politics and would renew their acquaintance later in life. Fisher and Hardie were leaders of the 1881 Ayrshire miners' strike, which was widely seen as a failure. The ten-week strike resulted in only a small pay rise rather than the 10 percent that had been asked for; many workers depleted their savings and some cooperatives came close to bankruptcy. Fisher had originally been opposed to the strike, and unsuccessfully attempted to negotiate a compromise with mine-owners. He lost his job, but soon found work at a different mine. Like many miners, Fisher was a supporter of Gladstone's Liberal Party, in particular the "Liberal-Labour" candidates who had the support of the unions. In 1884, he chaired a public meeting in Crosshouse in support of the Third Reform Bill. He subsequently wrote a letter to Gladstone and received a reply thanking him for his support. The following year, Fisher was involved in another miners' strike. He was not only sacked but also blacklisted. He was left with little future in Scotland and decided to emigrate; his older brother John had already left for England a few years earlier, becoming a police constable in Liverpool. Fisher and his younger brother James arrived in Brisbane, Queensland, on 17 August 1885, after a two-month steamship journey from London. He first saw Australia during a stopover at Thursday Island, where whites were a minority and there was a large Japanese population. His biographer David Day has speculated that this initial first impression may have contributed to his later opposition to non-white immigration. Fisher's path to Australia was virtually identical to that of Billy Hughes, who had arrived less than a year earlier in December 1884 – both men took assisted passage, arrived at the age of 22, and travelled from London to Brisbane. Unlike Hughes, Fisher never lost his original accent and retained a thick Scottish "brogue" for the rest of his life. After arriving in Brisbane, Fisher made his way to the Burrum River coalfields where there were already a number of Scottish miners. He began as an ordinary miner and joined the local miners' union, but after successfully sinking a new shaft at Torbanlea was employed as a mine manager. Prospering financially for the first time in his life, he built a timber cottage at Howard and began investing in shares. Fisher moved to the larger gold-mining town of Gympie in 1888, initially working in the No. 1 North Phoenix mine and then in the South Great Eastern Extended. He continued his involvement in unionism, helping form the Gympie branch of the Amalgamated Miners' Association (AMA) and serving terms as secretary and president. He obtained an engine-driver's certificate in 1891, and was elected president of the related craft union. This new job allowed him to work above-ground, operating the machinery that raised and lowered the cages in the mineshaft. During his time in Gympie, Fisher stayed in a boardinghouse in Red Hill; it is now heritage-listed as "Andrew Fisher's Cottage". He would eventually marry his landlady's daughter, Margaret Irvine. Within years of arriving in the town, Fisher had become "an important figure in the Gympie labour movement, straddling both its political and industrial wings". He was a founding member of the Gympie cooperative, and in 1891 became the secretary of the Gympie Joint Labour Committee, the local labour council. He helped establish a branch of the Workers' Political Association, the forerunner of the Labor Party, and served as the inaugural branch president with George Ryland as secretary. In 1892, he represented Gympie at the Labour-in-Politics Convention in Brisbane. He was sacked from his engine-driving job in the same year, and subsequently devoted his full attention to politics. In 1891, Fisher was elected as the first president of the Gympie branch of the Labour Party. In 1893, he was elected to the Legislative Assembly of Queensland as Labour member for Gympie and by the following year had become Labour's deputy leader in the Legislative Assembly. In his maiden speech, he pushed for a 50% decrease in military spending and declared support for a federation. He was also active in the Amalgamated Miners Union, becoming President of the Gympie branch by 1891. Another policy area that captured his attention during this term, was the employment of workers from the Pacific Islands in sugar plantations, a practice that Fisher and Labour both strongly opposed. He lost his seat in 1896 following a campaign in which he was charged by his opponent Jacob Stumm with being a dangerous revolutionary and an anti-Catholic, accusations that were propagated by the newspaper Gympie Times. The 1896 establishment of the Gympie Truth, a newspaper that he was to partly own, was part of his response. Intended as a medium to broadcast Labour's message, the newspaper played a vital role in Fisher's return to parliament in 1899. This time, he was the beneficiary of a scare campaign, in which conservative candidate Francis Power was consistently painted by the Gympie Truth as being a supporter of black labour and the alleged economic and social ills that accompanied it. In that year he was Secretary for Railways and Public Works in the seven-day government of Anderson Dawson, the first parliamentary Labour government in the world. Labour Party MPs elected at the inaugural 1901 election, including Watson, Fisher, Hughes, O'Malley, and Tudor. The state Labour parties and their MPs were mixed in their support for the Federation of Australia. However Fisher was a firm federationist, supporting the union of the Australian colonies and campaigned for the 'Yes' vote in Queensland's 1899 referendum. Fisher stood for the electorate of Wide Bay at the inaugural 1901 federal election and won the seat, which he held continuously for the rest of his political career. At the end of 1901, Fisher married Margaret Irvine, his previous landlady's daughter. Fisher supported the White Australia policy but also argued that any Kanaka who had converted to Christianity and married should be allowed to remain in Australia. Labour improved their position at the 1903 election, gaining enough seats to be on par with the other two, a legislative time colloquially known as the "three elevens". When the Deakin government resigned in 1904, George Reid of the Free Trade Party declined to take office, resulting in Labour taking power and Chris Watson becoming Labour's first Prime Minister for a four-month period in 1904. Fisher established and demonstrated his ministerial capabilities as Minister for Trade and Customs in the Watson Ministry. The fourth Labour member in the ministry after Watson, Hughes, and Lee Batchelor, Fisher was promoted to Deputy Leader of the Labour Party in 1905. Fisher in 1904, around the time of the Watson Government. At the 1906 election, Deakin remained Prime Minister even though Labour gained considerably more seats than the Protectionists. When Watson resigned in 1907, Fisher succeeded him as Labour leader, although Hughes and William Spence also stood for the position. Fisher was considered to have a better understanding of economic matters, was better at handling caucus, had better relations with the party organisation and the unions, and was more in touch with party opinion. He did not share Hughes' passion for free trade or that of Watson and Hughes for defence (and later conscription). In political terms he was a radical, on the left-wing of his party, with a strong sense of Labour's part in British working-class history. With a majority of seats in the Labour-Protectionist government, Labour caucus by early 1908 had become restive as to the future of the Deakin minority government. With the Deakin ministry in trouble, Deakin spoke to Fisher and Watson about a possible coalition, and following a report agreed to it providing Labour had a majority in cabinet, that there was immediate legislation for old-age pensions, that New Protection was carried and that at the following election the government would promise a progressive land tax. No coalition was formed, however the pressure from Labour brought about productive change by Deakin: he agreed to a royal commission into the post office, old-age pensions were to be provided from the surplus revenue fund and £250,000 set aside for ships for an Australian Navy. New Protection was declared invalid by the High Court in June, Fisher found the tariff proposals of Deakin unsatisfactory, while caucus was also dissatisfied with the old-age pension proposals. Without Labour support the Deakin government collapsed in November 1908. Fisher formed his only minority government and the First Fisher Ministry. The government amended the Seat of Government Act providing for the new federal capital to be in the Yass-Canberra area, passed the Manufacturers' Encouragement Act to provide bounties for iron and steel manufacturers who paid fair and reasonable wages, ordered three torpedo boat destroyers, and assumed local naval defence responsibility and placed the Australian Navy at the disposal of the Royal Navy in wartime. Fisher committed Labour to amending the Constitution to give the Commonwealth power over labour, wages and prices, to expanding the navy and providing compulsory military training for youths, to extending pensions, to a land tax, to the construction of a transcontinental railway, to the replacement of pound sterling with Australian currency and to tariffs to protect the sugar industry. In May 1909, the more conservative Protectionists and Freetraders merged to form the Commonwealth Liberal Party, while the more liberal Protectionists joined Labour. With a majority of seats, the CLP led by Alfred Deakin ousted Labour from office, with Fisher failing to persuade the Governor-General Lord Dudley to dissolve Parliament. A studio portrait of the Prime Ministerial family in 1910. At the 1910 election, Labour gained sixteen additional seats to hold a total of forty-two of the seventy-five House of Representatives' seats, and all eighteen Senate seats up for election to hold a total of twenty-two out of thirty-six seats. This gave Labour control of both upper and lower houses and enabled Fisher to form his Second Fisher Ministry, Australia's first elected federal majority government, Australia's first elected Senate majority, and the world's first Labour Party majority government. The 113 acts passed in the three years of the second Fisher government exceeded even the output of the second Deakin government over a similar period. 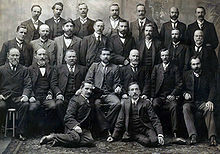 The 1910–13 Fisher government represented the culmination of Labour's involvement in politics, and was a period of reform unmatched in the Commonwealth until the 1940s, under John Curtin and Ben Chifley. The Fisher government carried out many reforms in defence, constitutional matters, finance, transport and communications, and social security, achieving the vast majority of their aims in just three years of government. These included establishment of old-age and disability pensions, a maternity allowance and workers compensation, issuing Australia's first paper currency, forming the Royal Australian Navy, the start of construction of the Trans-Australian Railway, expanding the bench of the High Court of Australia, the founding of Canberra, and the establishment of the state-owned Commonwealth Bank. Fisher's second government also introduced uniform postal charges throughout Australia, carried out measures to break up land monopolies, put forward proposals for closer regulation of working hours, wages and employment conditions, and amended the 1904 Conciliation and Arbitration Act to provide greater authority for the court president, and to allow for Commonwealth employees' industrial unions, registered with the Arbitration Court. A land tax, aimed at breaking up big estates and give wider scope for small-scale farming, was also introduced, while coverage of the Arbitration system was extended to agricultural workers, domestics, and federal public servants. In addition, the age at which women became entitled to the old-age pension was lowered from sixty-five to sixty. The introduction of the maternity allowance was a major reform, because it enabled more births to be attended by doctors, thus leading to reductions in infant mortality rates. Compulsory preference to trade unionists in federal employment was also introduced, while the Seaman's Compensation Act of 1911 and the Navigation Act of 1912 were enacted to improve conditions for those working at sea, together with compensatory arrangements for seamen and next of kin. Eligibility for pensions was also widened. From December 1912 onwards, naturalised residents no longer had to wait three years to be eligible for a pension. That same year, the value of a pensioner's home was excluded from consideration when assessing the value of their property. Andrew Fisher at the naming of Canberra ceremony, 1913. The governor-general, Lord Denman, is standing to the left of Fisher, while King O'Malley, Minister for Home Affairs, is at the far left of the photo (conversing with Lady Denman who was given the honour of pronouncing the new capital's name for the first time). Fisher wanted additional Commonwealth power in certain areas, such as the nationalisation of monopolies. A constitutional referendum was initiated in 1911 which aimed to increase the federal government's legislative powers over trade and commerce and over monopolies. Both questions were defeated, with around 61 per cent voting 'No'. The Fisher government made another attempt, holding a referendum in 1913 which asked for greater federal powers over trade and commerce, corporations, industrial matters, trusts, monopolies, and railway disputes. All six questions were defeated, with around 51 per cent voting 'No'. At the 1913 election, the Commonwealth Liberal Party, led by Joseph Cook, defeated the Labor Party by a single seat. Labor retained control of the Senate despite defeat. In 1914, Cook, frustrated by the Labor-controlled Senate's rejection of his legislation, recommended to the new Governor-General Sir Ronald Munro Ferguson that both houses of the parliament be dissolved and elections called. This was Australia's first double dissolution election, and the only one until the 1951 election. The First World War had broken out in the middle of the 1914 election campaign, with both sides committing Australia to the British Empire. Fisher campaigned on Labor's record of support for an independent Australian defence force, and pledged that Australia would "stand beside the mother country to help and defend her to the last man and the last shilling". Labor won the election with another absolute majority in both houses and Fisher formed his Third Fisher Ministry. Fisher and his party were immediately underway in organising urgent defence measures for planning and implementing Australian war effort. Fisher visited New Zealand during this time which saw Billy Hughes serve as acting Prime Minister for two months. Fisher and Labor continued to implement promised peacetime legislation, including the River Murray Waters Act 1915, the Freight Arrangements Act 1915, the Sugar Purchase Act 1915, the Estate Duty Assessment and the Estate Duty acts in 1914. Wartime legislation in 1914 and 1915 included the War Precautions acts (giving the Governor-General power to make regulations for national security), a Trading with the Enemy Act, War Census acts, a Crimes Act, a Belgium Grant Act, and an Enemy Contracts Annulment Act. In December 1914, a War Pensions Act was passed to provide for the grant of Pensions upon the death or incapacity of Members of the Defence Force of the Commonwealth and Members of the Imperial Reserve Forces residents in Australia whose death or incapacity resulted from their employment in connection with warlike operations. Fisher passed this report on to Hughes and to Defence Minister George Pearce, ultimately leading to the evacuation of the Australian troops in December 1915. The report was also used by the Dardanelles Commission on which Fisher served, while High Commissioner in London. Fisher resigned as Prime Minister and from Parliament on 27 October 1915 after being absent from parliament without explanation for three sitting days. Three days later, Labor Caucus unanimously elected Billy Hughes leader of the Federal Parliamentary Party. Fisher's seat was narrowly won by the Commonwealth Liberal Party on a 0.2% margin at the 1915 Wide Bay by-election. Australia's second High Commissioner to the United Kingdom. Fisher served as Australia's second High Commissioner to the United Kingdom from 1 January 1916 until 1 January 1921. Fisher opposed conscription which made his dealings with Billy Hughes difficult. Hughes asked Fisher for support by cable three weeks before the first referendum, but Fisher cabled back "Am unable to sign appeal. Position forbids." He subsequently refused to publicly comment on the issue. Hughes' 1916 referendum on conscription had a No vote of around 52 per cent, while the 1917 referendum had a No vote of around 54 per cent. Fisher visited Australian troops serving in Belgium and France in 1919, and later presented Pearce with an album of battlefield photos from 1917 and 1918, showing the horrendous conditions experienced by the troops. The Dardanelles Commission, including Fisher, interviewed witnesses in 1916 and 1917 and issued its final report in 1919. It concluded that the expedition was poorly planned and executed and that difficulties had been underestimated, problems which were exacerbated by supply shortages and by personality clashes and procrastination at high levels. Some 480,000 Allied troops had been dedicated to the failed campaign, with around half in casualties. The report's conclusions were regarded as insipid with no figures (political or military) heavily censured. The report of the Commission and information gathered by the inquiry remain a key source of documents on the campaign. Fisher's term as High Commissioner officially ended on 22 April 1921, although it concluded with three months’ paid leave and he left for Australia on 29 January. He arrived back in Melbourne with no firm plans for his future, but the rapturous receptions he received at labour movement gatherings led him to contemplate a return to active politics. He was the only remaining former prime minister in the Labor Party, which had lost many experienced MPs in the 1916 party split. The party's leader Frank Tudor had been suffering frequent bouts of ill health, and T. J. Ryan, who was widely seen as Tudor's heir apparent, died suddenly of pneumonia in August 1921. Fisher seriously considered standing in the resulting by-election, but found there was no guarantee that the local party would accept him as a candidate. He was unwilling to actively campaign for preselection, and decided he would only stand if he were drafted; this did not eventuate. With little else to keep them in Australia, Fisher and his wife decided to return to London to be closer to their children. They rented a property in Highgate for a period, and then in October 1922 bought a home on South Hill Park near Hampstead Heath. He explored the possibility of standing for the British House of Commons, but eventually opted for a permanent retirement from politics. By the time he was 60, Fisher's family and friends had begun to notice a decline in his mental faculties, which was probably a form of early-onset dementia. It was judged unsafe for him to be out alone in public, and in 1925 his assets were placed in trust. By 1928, he was unable to sign his own name, and his children were seriously considering having him institutionalised. Fisher contracted a severe case of influenza in September 1928, and eventually succumbed to complications of the disease on 22 October, aged 66. He is one of only three Australian prime ministers to die overseas, and he and George Reid are the only ones who both began and ended their lives outside Australia. Fisher was buried at Hampstead Cemetery on 26 October 1928. On the same day, a memorial service was held at St Columba's Church, Knightsbridge, which was attended by representatives of King George V and Prime Minister Stanley Baldwin, as well as Arthur Henderson representing the British Labour Party. In February 1930, Prime Minister Ramsay MacDonald unveiled a granite obelisk above Fisher's grave. His widow eventually moved back to Australia, dying there in 1958. Despite the length of Fisher's service as prime minister, for many years he and his government were given relatively little scholarly attention. His decision to retire to England placed him out of the public eye, while his mental deterioration and early death deprived him of the opportunity to dictate his own legacy. Writers interested in the post-Federation era did not generally view him as an attractive biographical subject, which has been attributed to the relative orthodoxy of his political views and a reputation for propriety to the point of dullness. Fisher's 1981 entry in the Australian Dictionary of Biography was written by Denis Murphy, who had planned a full-length biography but died in 1984 before completing it. Clem Lloyd also began a biography in the 1990s, which was unfinished at the time of his death in 2001. The first complete biographies of Fisher did not emerge until the 100th anniversary of his prime ministership. These were David Day's Andrew Fisher: Prime Minister of Australia (2008) and Peter Bastian's Andrew Fisher: An Underestimated Man (2009), as well as a shorter volume by Edward Humphreys, Andrew Fisher: The Forgotten Man (2008). Obituarists of Fisher generally emphasised his modesty, integrity, and dedication to the labour movement. Writing for The Australian Worker, Henry Boote praised him as "loyal to his class, courageous in the advocacy of their cause, and absolutely incorruptible". In the decades after his death, a general view emerged of Fisher as a competent rather than brilliant leader. He was praised for successfully managing the conflicting personalities within his own party, but as a leader of his country was often compared unfavourably with Deakin and Hughes. In general, his prime ministership was seen as a relatively inconsequential interlude. However, beginning in the 1970s a different view of Fisher began to emerge, which coincided with more of his personal papers becoming available to researchers. His more recent biographers have credited Fisher with establishing Labor as a viable party of government and demonstrating that the party's platform did not have to be sacrificed for political expediency, and argued that he deserves the primary credit for the political and electoral accomplishments of his governments. He is now generally seen as one of the most significant figures in the early years of his party. At the end of the First World War, France awarded him the Légion d'honneur, but he declined it; he did not like decorations of any kind and adhered to this view throughout his life. The federal electorate of Fisher was named after him. A Canberra suburb, Fisher, was also created in his memory, with its streets reflecting a mining theme in honour of Fisher's occupation before entering public life. Ramsay MacDonald, Britain's first Labour Prime Minister, unveiled a memorial to Fisher in Hampstead Cemetery in 1930. A memorial garden was also dedicated to Fisher at his birthplace in the late 1970s. In 1972 he was honoured on a postage stamp bearing his portrait issued by Australia Post. In 1992, his home in Gympie (Andrew Fisher's Cottage) was listed on the Queensland Heritage Register. In 2008, Labor Prime Minister Kevin Rudd launched a biography titled Andrew Fisher, written by David Day. In turn, Rudd was presented with an item that once belonged to Fisher - a slightly battered gold pen engraved with Fisher's signature, which had been held in safekeeping for 80 years. ^ On his marriage certificate, Fisher's mother signed her name but his father signed an "X". He may have been able to read, however, as schools in the early 19th century sometimes charged separately for reading and writing. ^ Fisher recounted in 1911 that he had begun his education at "a little private school", before attending "the old schoolhouse" in Crosshouse, the village school in Dreghorn, and then a new school in Crosshouse. He probably also attended Sunday school. ^ Bastian believes that Fisher left when he was nine years old, and may have exaggerated his leaving age as an adult because he was self-conscious about his lack of education. He suggests that he was withdrawn from school early to avoid the provisions of the newly enacted Education (Scotland) Act 1872, which mandated compulsory attendance until the age of 13. The price of coal and miners' wages increased during the Franco-Prussian War, which may have provided a financial incentive for younger children to begin work; however, it would still have been illegal for a nine-year-old to work in the mines. Day instead argues that Fisher remained in school until he was thirteen. His parents were known to value education and could afford to have him stay in school until the legal leaving age. He notes a 1911 interview in which Fisher gave his leaving age as thirteen, and suggests that references to him being underground at an earlier age are ambiguous, as he could have simply been visiting his father and older brother rather than actually working. ^ a b c d e f g h i j k l m n Murphy, D. J. (1981). "Fisher, Andrew (1862–1928)". Australian Dictionary of Biography. Australian National University. Archived from the original on 25 May 2011. Retrieved 12 May 2011. ^ a b David Day (2008). Andrew Fisher: Prime Minister of Australia. Fourth Estate. p. 2. ^ Peter Bastian (2009). Andrew Fisher: An Underestimated Man. UNSW Press. p. 1. ^ a b Day (2008), p. 5. ^ Bastian (2009), p. 15. ^ Bastian (2009), p. 12. ^ a b Bastian (2009), p. 6. ^ a b Bastian (2009), p. 5. ^ Day (2008), p. 10. ^ a b Day (2008), pp. 8–9. ^ Day (2008), p. 9. ^ Bastian (2009), p. 7. ^ Bastian (2009), pp. 18–19. ^ Day (2008), p. 18. ^ Bastian (2009), p. 20. ^ Day (2008), p. 17. ^ Day (2008), p. 23. ^ Day (2008), pp. 24–25. ^ Day (2008), p. 26. ^ Day (2008), p. 27. ^ Bastian (2009), p. 35. ^ Day (2008), p. 33. ^ Day (2008), p. 142. ^ Bastian (2009), p. 230. ^ Day (2008), p. 35. ^ Day (2008), pp. 37–38. ^ Day (2008), p. 41. ^ Day (2008), p. 49. ^ Day (2008), p. 51. ^ Day (2008), p. 52. ^ Day (2008), p. 53. ^ Bastian (2009), p. 57. ^ Day (2008), p. 54. ^ Day (2008), p. 55–56. ^ Day (2008), p. 57. ^ a b c Day, D. (2008). Andrew Fisher: prime minister of Australia. HarperCollinsPublishers. ISBN 978-0-7322-7610-2. ^ "Federation Political Groups—to 1901 and beyond". National Library of Australia. Archived from the original on 30 August 2007. Retrieved 31 August 2007. ^ "Andrew Fisher, Before office". Australia's Prime Ministers. National Archives of Australia. Retrieved 9 February 2010. ^ a b c d e f "Andrew Fisher, In office". Australia's Prime Ministers. National Archives of Australia. Retrieved 9 February 2010. ^ "Andrew Fisher". Australianhistory.org. Archived from the original on 14 November 2010. Retrieved 15 November 2010. ^ "ComLaw: Acts by Year / Number". comlaw.gov.au. ^ "1912 Commonwealth of Australia Numbered Acts". austlii.edu.au. ^ "Social Security Payments for the Aged, People with Disabilities and Carers 1909 to 2002". nla.gov.au. Archived from the original on 14 September 2004. ^ "War Pensions Act 1914". comlaw.gov.au. ^ Fitzhardinge, L. F. (1983). "Hughes, William Morris (Billy) (1862–1952)". Australian Dictionary of Biography. Canberra: Australian National University. Retrieved 30 August 2007. ^ a b "Andrew Fisher, After office". Australia's Prime Ministers. National Archives of Australia. Retrieved 9 February 2010. ^ "Battles: The Gallipoli Front - An Overview". Firstworldwar.com. 18 August 2002. Retrieved 30 August 2007. ^ Fisher, Mackensie; Cawley; Clyde; Gwynn; May; Nicholson, Lord; Pickford; Roch (February 1917). "First report (of the Dardanelles Commission) (Abstract)". British Official Publications Collaborative Reader Information Service. Archived from the original on 27 September 2007. Retrieved 12 May 2011. ^ Day (2008), p. 401. ^ Day (2008), pp. 402–406. ^ Day (2008), p. 406. ^ Day (2008), p. 407. ^ Day (2008), pp. 408–410. ^ Day (2008), pp. 410–411. ^ Day (2008), p. 411. ^ a b Edward W. Humphreys (2005). Some aspects of the federal political career of Andrew Fisher (PDF) (MA thesis). University of Melbourne. ^ Day (2008), p. 414. ^ a b Stephen Matchett (2009). "Review of the reviewers". Sydney Institute Quarterly. 35. ^ David Day (2009). "Review of Edward W. Humphreys' Andrew Fisher: The Forgotten Man". History Australia. 6 (1). ^ Day (2008), p. 412. 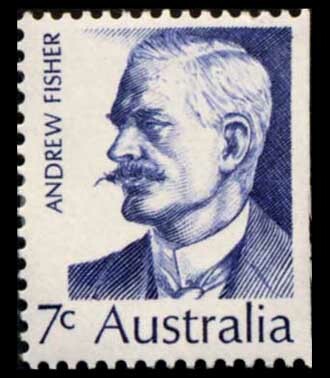 ^ "Australia Post stamp - Andrew Fisher". Retrieved 15 November 2010. ^ "Andrew Fishers Cottage (entry 600537)". Queensland Heritage Register. Queensland Heritage Council. Retrieved 1 August 2014. ^ "Rudd launches biography of ex-PM Fisher: The Age 29 October 2008". News.theage.com.au. 29 October 2008. Retrieved 15 November 2010. ^ "Prime Minister launches biography of Andrew Fisher (Full speech)" (PDF). Australian Government. Retrieved 9 February 2010. Wikimedia Commons has media related to Andrew Fisher.